I really love writing this wee column about what I’ve been up to here in the USA. But sitting down to write about the couple of weeks since the Oscars from the resort town of Aspen – well, I love it even more. I’ve shared dinners here in the past with Michael Douglas and Catherine Zeta Jones, so this skiing retreat in the Rocky Mountains is one of my favourite places. The week kicked off at The Little Nell, the legendary hotel, and ended at the newest venue in Snowmass, the mountain range we’re in, called The Limelight. You can literally ski in and out of both hotels, where you’re greeted with champagne and hot chocolate. I learned to ski in Aviemore where I was more worried about not looking like a one-man avalanche. The closest I got to champagne and chocolates was a carton of Ribena and a Mars bar on the drive home. Both hotels have luxurious ski concierge services and are pet-friendly so you can bring your own dog. That’s handy for someone like Mariah Carey, who loves her dogs, almost as much as she loves Aspen. When I interviewed Mariah recently we both agreed that Aspen is the most magical place and that’s why we both return year after year…but not together! I managed to make Gary Barlow so jealous of my trips here that not long after I posted an Aspen arrival pic on Instagram he was quick to respond. “Enjoy the skiing!” and “Have a glass of fizz for me”…are some of the things he didn’t say. “I hate you”, he simply responded. Cheers Gaz! 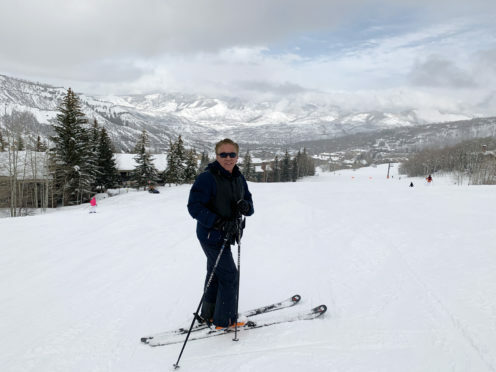 He is threatening to come out later this year, too – so we might see Mr Barlow on the slopes soon. Brianna and I lunched at the So Cafe at the top of the gorgeous Aspen Art Museum where you can enjoy the exhibits free of charge – my favourite price. As I was wandering around I was stopped in my tracks by a piece of art. It turned out to be by Scottish artist and poet Robert Montgomery. We then dined at Aspen’s new hotspots Clark’s restaurant and Betula. Both were spectacular, as was the Toro Restaurant. After skiing, we enjoyed holistic massages at the Viceroy – just the perfect way to end our holiday. Back to auld clathes and porridge next week!